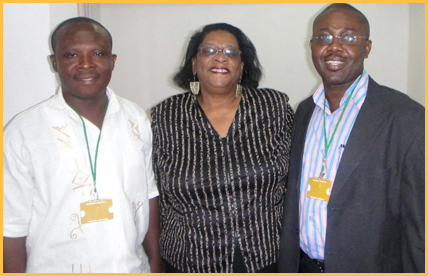 Dr. Linda Hayden met with Dr. George Wiafe and Dr. Francis Nunoo during travel to the University of Ghana January 2011. Drs. Nunoo and Wiafe are Senior Lecturers in the Faculty of Sciences, Oceanography and Fisheries at the University of Ghana. Dr. Nunoo currently serves as chair of the department. Dr. Wiafe who is a collaborator on ONR grant # URE/OMS N00008-1-0832 has research activities which include: Impact of hydrological and climatic factors on marine plankton communities; Assessment of primary productivity using remote sensing; and GIS applications in coastal management. The Department of Oceanography and Fisheries is Ghana’s foremost university institution primarily concerned with oceanographic and fisheries research and training. The Department runs a Bachelors program combined-major in Oceanography and Fisheries which is designed to provide students with the requisite knowledge and skills that will enable them to avail themselves of employment opportunities in the fishing industry, conservation, education, environmental protection, food and agriculture or embark on individual initiatives. There is also the opportunity for them to further their studies at the graduate level where the Department runs both Master and Doctorate programs in Fisheries and Oceanography. The Oceanography programs specialize in Biological, Physical and Chemical Oceanography and Marine Geoscience. Conduct academic year follow up with the four students who participated in the Undergraduate Research Experience during summer 2010. Interview and select participants for the summer 2011 URE program.